Creepy Cloches – A Kbatz Craft! Creating Creepy Cloches – A Kbatz Kraft! 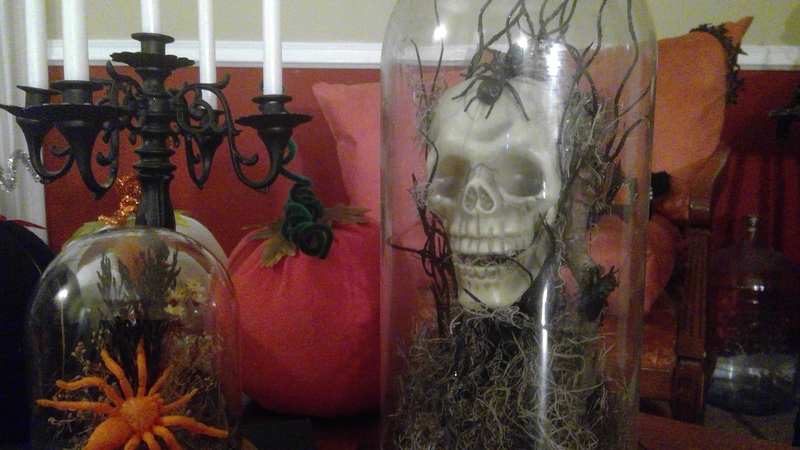 Kristin Battestella aka Kbatz here again to show our Horror Addicts Community how to make your very own Spooky but affordable cloches for Halloween or year round macabre décor! For us alternative folks, it really pays to shop at thrift and second hand shops to find off the beaten path accessories. I lucked into finding two actual cloches, one large and one small, at two different Goodwill stores. The smaller cloche was $1 and already had the orange floral décor inside, so I put a fun orange spider from a Dollar Store party favor pack inside, keeping the orange theme for Halloween rather than something more realistic like a black spider. The larger cloche was $3 – a steal when more elaborate Halloween cloches in stores cost $10 or more for whatever generic creepy is inside them. This actually had an unusual Good King Wenceslas doll inside that looks slightly creepy itself. I don’t trust him, so he’s going right back inside a homemade Christmas cloche! Once he was out, I put a Dollar Store skull on a pedestal inside and used hot glue to surround the skull with glittery Dollar Store branches and stems. I originally wanted to fan the branches all the way around, but obviously, the glass lid has to fit over the design, so the branches became a more compact bunch with smaller pieces in front going inside the skull’s open mouth for full effect. Naturally I intended to have a bat perched on top the skull, but it was too big for the glass and I used a plastic ant instead. Next I used Dollar Store moss to cover the pedestal base. Some of it sits where I need it, but other places I again hot glued strategic moss in place. As this is a three dimensional glass display, the back must look just as nice as the front. I planned a realistic spider below in front to create visual balance. However, I found the large stick inside my moss bag and went with it as a perch for a bug from my spooky favors assortment. I could have gone outside and used natural leaves, moss, and branches, but I’m quite pleased with how this cloche came out. It looks like a skull was once preserved, but it’s as if something grew around it and died – a pleasingly morose display I might keep out year round! In addition to these two lucky finds, I also saved several large party mix plastic barrels to make homemade Halloween cloches. Truly, the most difficult part of all these DIY crafts was getting the darn labels off these jugs! Fortunately or unfortunately, the most expensive thing in all these projects for my wallet and waist was eating these snacks! Instead of trying to fit everything through the jar opening, I cut the top off so I could turn it upside down. The edge didn’t have to be perfect because I would cover it with moss, but I did get cut doing this. It’s official, I’ve bled for HorrorAddicts.net! I put a Dollar Store glow in the dark skull on top of more natural green moss with glittery green branches and added glow in the dark spiders. My base for this was a simple plastic plate, and it is a little flimsy compared to the wood bases of the real cloches. In the future I might get wooden plaques available at the craft store or natural rounds. One can set a homemade cloche on something fancy like a silver platter or cake stand, but obviously we’re not permanently gluing the base with those. To cover the lingering label lines on my jar, I strategy placed more moss as if it was growing up the outside and top of the cloche complete with a glow in the dark bat as the piece de resistance. My idea here is that this was something alive but now overgrown. Naturally, the cutting and hot glue are not family friendly crafting, and different materials can be used if a child has any allergies. 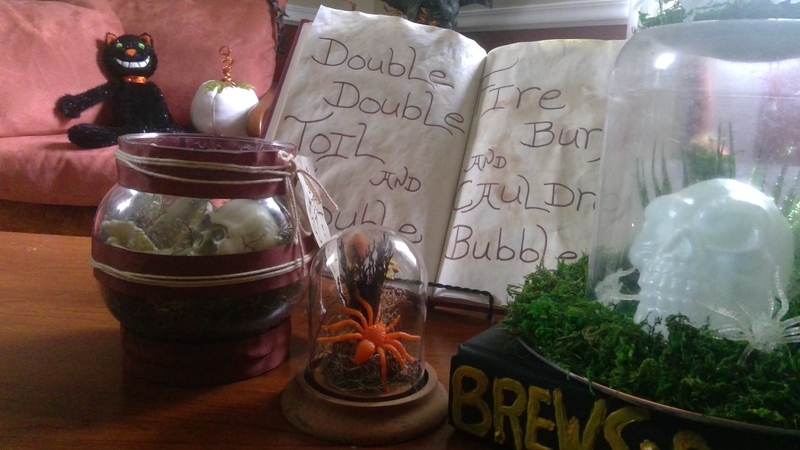 Since this is fairly lightweight, I wouldn’t put it where kids or pets may knock it over or keep it out year round – and be warned the moss may attract real spiders and the like! I quite like how this cloche turned out, however, side by side with the real glass cloches, you can tell it is plastic and homemade. Then again, in cutting off the tops of two party mix jugs and putting them together, I ended up with a bonus orb which, as I posted on our Horror Addicts.net Facebook community, I was unsure how to use. I debated using bloody drips to make it look like something bloody escaped or filling it with spider webbing like there was something cloudy and unseen inside before filling it with assorted plastic bones. I glued brown ribbon on to cover the jar rims and seams and then tied rustic yarn around it for an apothecary style, adding a ‘Do Not open until October 31’ tag and leaving off the top lid. My theory is that something was alive inside, but opening it early turned what was within to bones. Although that might not be immediately apparent, the beauty here is that it was a free bonus project that can be changed next Halloween. 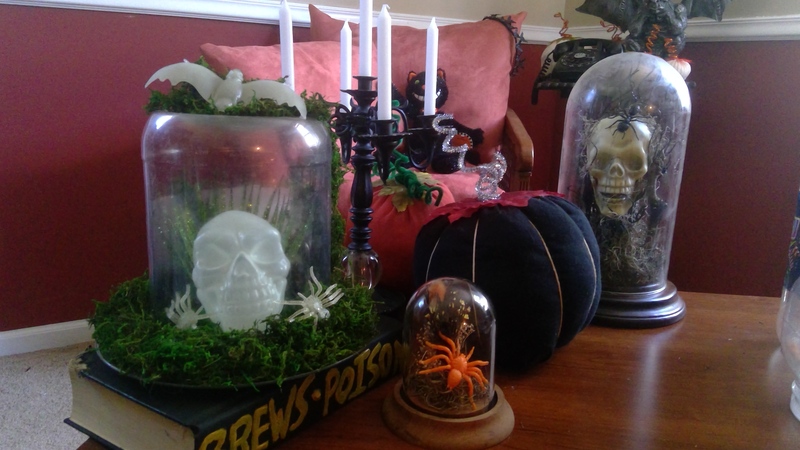 By being thrift savvy and using affordable materials, I have several creepy cloches providing the most bang for my Halloween buck, and I hope you have some ideas for your own one of kind cloches, too!